Build your own white label SEO platform experience with a custom sub-domain and your very own branding. Upload your logos and change the CSS styling to produce the platform experience that is right for you and your clients. Should you wish, upload your own default PDF and PPT templates. And if you’re an agency, you can even re-brand our very own lead generation tool. We’re open to assisting you with whatever white-label personalization requirements you might have. 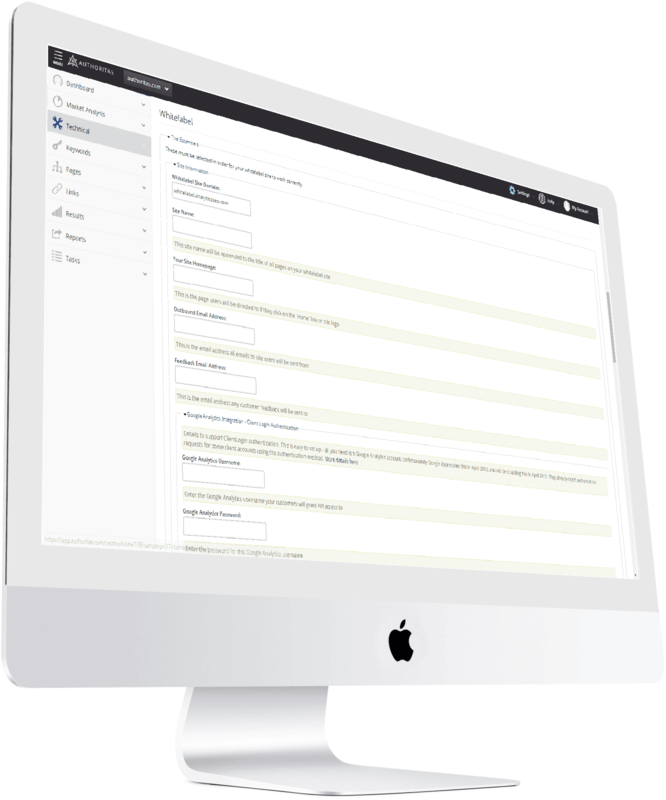 However, you’ll generally find that whatever your requirements, you’ll be able to change the look and feel of the Authoritas platform and reporting styles to suit your needs. That’s not to say that you can’t get up and running immediately though. We also offer standardized reporting should you not wish to personalize the templates any further. Note: You can customize specific modules, as well as filtering graphs and tables to ensure you see exactly the data and time range you require.